Two ends of the waste line is one work in two parts: a video installation consisting of a video projection (East) and a crocheted carpet (West). The work is a discussion between two geographical locations, which are connected by textile waste, a byproduct of textile and fashion industries. 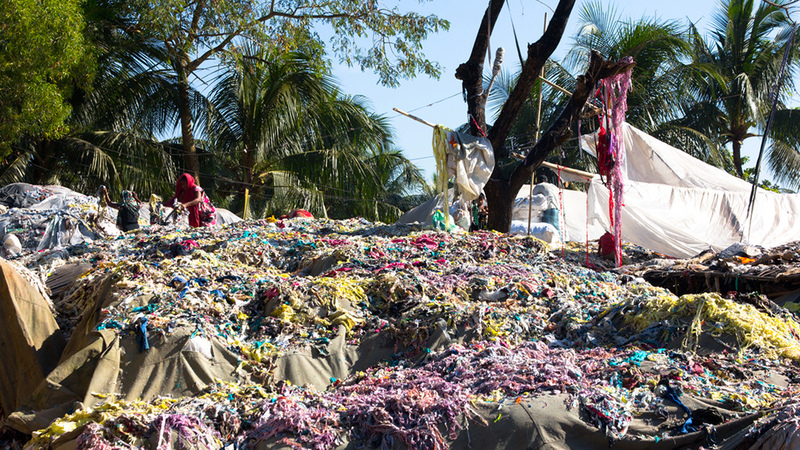 East is filmed in Chittagong, Bangladesh, on a textile waste landfill. It is the place where textile scraps and other garment factory leftovers get transported to. At the landfill, there are people working sorting the material, which then gets sold forward to another place, where another set of anonymous workers deal with it. The film is a non-narrative visual exploration of the landfill and the workers. West is made in Oslo of old bed sheets and clothes donated by private homes in Norway and Helsinki Metropolitan Area Reuse Center in Finland. I learned my handicraft skills from my grandmothers. One of them made crocheting and the other one used to recycle old textiles by making rag rugs. Nowadays this tradition has been mostly forgotten, carpets are bought from IKEA and textile waste ends up in landfills. Each person living in Helsinki region, for example, throws on average 10 kg worth of textiles to waste per year. This is characteristic of our economic system: more waste means more consumption and recycling by making handicrafts is not considered to be cost-effective. EXCERPT: Two Ends of the Waste Line: East from Anna Knappe on Vimeo.